Lionheart started the 2015 J Class racing year in the same way they did their 2014 season, with a win. 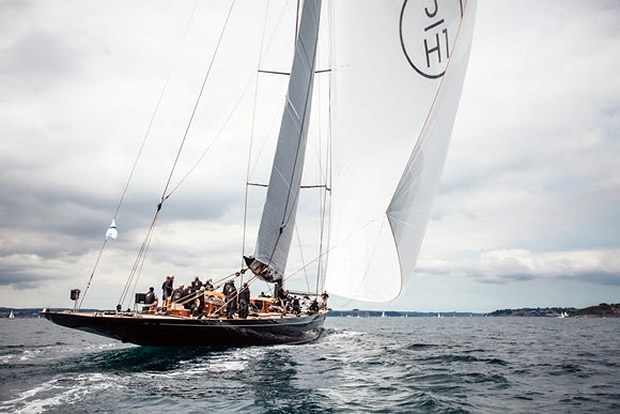 But as she crossed the finish line off Falmouth's Pendennis Castle to take the first winning gun of the J Class Falmouth Regatta it partly atoned for a disappointing finale to last year in Saint Tropez and also marked the first race victory since Olympic medallist John Cutler joined as tactician. In the light 6-8 knot southerly breeze, Cutler, in concert with new Norwegian Volvo Ocean Race navigator Aksel Magdahl, called shifts on the first two mile windward leg to perfection, rounding the top mark with a small lead over Ranger. They made their key gain during the final third of the first beat, extending away after a close call when they close tacked only just ahead of Ranger. Their move was green flagged by the on-the-water umpire, a new initiative for the class regattas this season, and for the remainder of the two upwind, two downwinds course in the shifting breeze, Lionheart was not challenged. The start to race 1 was delayed until 1400 until the light breeze settled in. Velsheda, with Tom Dodson calling tactics, made the best timed start on port tack, heading inshore in to the bay. Lionheart was not quite as fleet footed off the line while Ranger worked the early left, offshore. Velsheda rolled in to challenge Ranger for second a couple of times, but the St Tropez regatta runaway victors had to settle for second as Cutler delivered his first win on Lionheart. He paid tribute to the Lionheart crew and the team at Falmouth's Pendennis Shipyard where the boat was refitted through the winter. That it came out from the yard in perfect, ready to race condition gained them three good, essential days of training before this regatta. Cutler commented on the dock: "The boat is going really fast. The owner was really locked in today and did a great job. And the boat is just out of Pendennis where it has been for six months." Of the crew changes precipitated by several of their team racing the Volvo Ocean Race with Team Brunel, Cutler remarked: "We picked new crew with good experience. And we got three days of good training because it ran so smoothly with Pendennis and our permanent team. So that was an advantage when it could have been three days fixing things. So credit to Pendennis and to our permanent crew. We turned up and it all worked. Everyone who touched the boat did a good job." The on the water umpiring meets with the approval of most of the teams. And the early, first beat call immediately ensured there was no dubiety. Cutler smiled: "I pushed for on the water umpires. It is a good thing for the class. Do we need aggravation on shore afterwards? We have someone on the water looks at it, one guy says 'you are right, you are wrong'. You come ashore and it's over, there is nothing more to say. I think it is a huge step forwards for these boats." Second placed Ranger's skipper-helm Erle Williams concluded: "It was a good race. It was a bit light for Ranger and Lionheart is a lighter boat. We had a good start and were going well, but Lionheart just had the legs on us on the first beat. We need 10-11-12 knots. It was just on the light side. We were not bad but Lionheart just had the legs on both of us. We were close with Velsheda, they came into us a few times. We have a lot of crew changes - 14 since the last regatta - and we have some guys doing the Volvo and so on - but we had three really good training days and the crew sailed really well today. Lionheart is very hard to beat in these conditions."